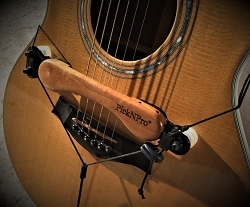 Sizing Template - Here is a dimensioned photo that you can use to check the size of the PickNPro® hand rest to see how it will fit on your guitar. Print on 8.5 x 11 (letter) paper, in landscape orientation. To ensure proper scaling, measure the 9" line and see if it's really 9".